Hush Panels are a big fan of looking after our wonderful country. 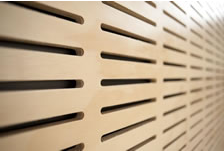 Hush Panels are manufactured from sustainable timbers and substrates. As an added bonus, all of our panels are factory finished – this means no onsite curing and releasing of VOCs. We are also able to offer low formaldehyde, FSC and COC options. Please contact us for more information regarding these or Green Build options.